I spent today harvesting lavender. It’s that time of year. The sun and the rain have done their work. Some of the heads still have nectar-filled flowers and I work alongside the bees, each of us gathering what we need. I am half hypnotized by their lazy drifting movements in the unexpected pleasure of a warm sunny day in September. Somebody told me last week that the Japanese call this time summer sleeping. It feels like a fitting term for today. My grandmother taught me to appreciate lavender. I spent many of my childhood summers with her and idleness was never an option. Even during the compulsory quiet hour after lunch we were expected to write a poem or create a crossword puzzle. Sometimes there would be half a dozen younger cousins there too, stacked up in camp-beds in her house or sleeping under the caravan awning in East Anglia or Yorkshire – somewhere within reach of the beach for the occasional sortie with an alarming array of equipment. I still have to remember – when I feel I haven’t got time to go to the beach – that nowadays I only need a towel and a book. I don’t need to struggle with armfuls of wind-breaks, deck chairs, thermos flasks, squashed sandwiches, buckets and spades and badminton racquets. Nor does sitting on the beach need to involve careful monitoring of the tides and continual setting up and decamping any more. (Why? Looking back on it now I am puzzled that we didn’t just start above the high tide mark, but maybe on those flat Norfolk beaches that would have been a mile from the waves at low tide, too far from paddling toddlers). In the evenings we would be organized for craft production. 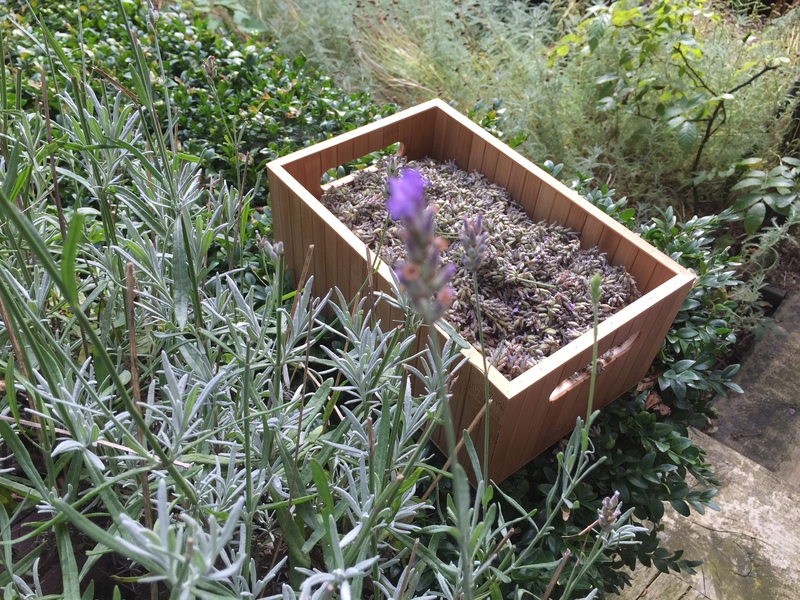 Somebody skinning dusty, heady lavender stalks into a bucket while another stitched small scraps of broderie anglaise to capture them into scented bundles destined for the fete. Elsewhere at the table a cousin old enough to be trusted with pins would be converting a cheap bar of soap into a curious Faberge-like object complete with a bead encrusted pin leg in each corner, elevated from the usual status of soap sitting in a small puddle of its own meltwater to a majestic thing, supported by jewels. Another might be adding sequins and ribbons to a wooden spoon, uplifting this everyday object to the status of wedding gift. We never questioned any of this, not the odd aesthetic or the questionable business model. We took our place in the production line, working earnestly and hoping to merit the highest praise of all for our work: “That’ll do” she might pronounce with a nod and we felt relief that it hadn’t been rejected for its wonky ric rac or uneven beads. 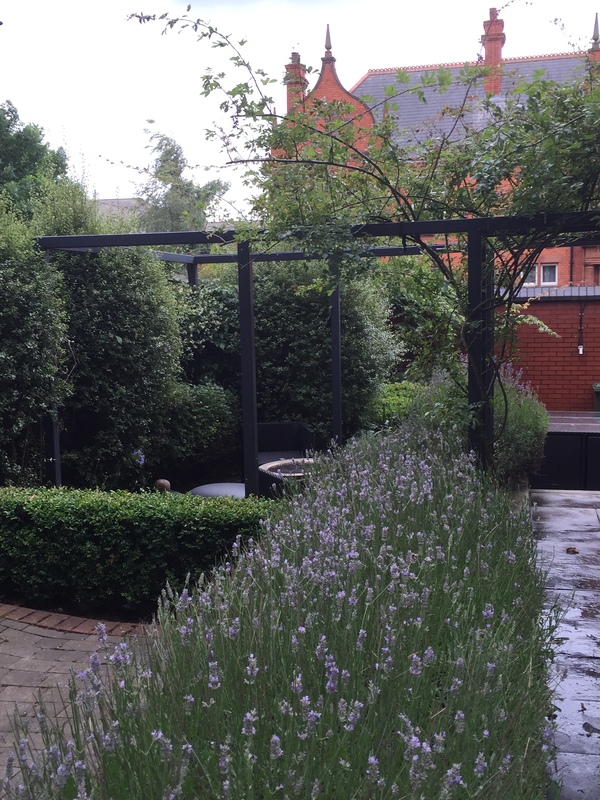 How differently the same then, that I now stand in the shelter of a post-industrial conversion, a high-end residential property in one of the global cities of the world, still harvesting lavender. It’s still an activity that doesn’t stand up to financial analysis, yet it’s strangely soothing. In the mild repetition I enjoy the distance it gives me from my plethora of everyday activity, the feeling I also get from a long walk, or a flight. It gives me a sense of being in my place in the world, a connection with the earth and the bees and the clear blue sky. It clears away my preoccupations and gradually, over the hours, I recover my sense of infinite possibility. That life is so long and the world so extensive that I have enough time to do so many things, live so many different ways, travel many lands, encounter many other travellers and learn many things. And in all this richness of combinations of thoughts and ideas and people and circumstances, if I remember to look, I will find many ways to feel moments of joy. A fey Finn wanders into the garden interrupting my lavender imbued trance. She looks like a troubadour, a minstrel. “Hello,” she announces herself. “I see you are a faerie. I am too. We all are. I saw you here and I would like to see your house.” I show her round. She talks a lot about her family – the Japanese guy, the New Yorker, the collection of wandering souls with whom she has created a home: “We love to eat together, make music together, compare our cultures and find new ideas”. She is a musician, an eco-technician, an artist, a philosopher “Nobody needs to be one thing any more, combinations are so much more interesting”. Maybe a faerie indeed. She brightens my day and thanks me for brightening hers as she hoists the paper clip handle of her pink flowered sack – “I love this bag. I don’t know why” onto her shoulder and strolls off again. I finish my harvesting. A crateful of healing scent. I relish my sense of calm and hope. A supremely worthwhile use of a day.